Along a canal in North Logan, Utah on January 2, 2003, at 11:30 p.m. MST, a very tall, hairy Bigfoot creature was seen walking along a canal behind houses. 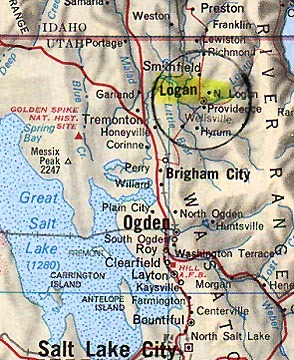 January 15, 2003 North Logan, Utah - The mother and son in a North Logan, Utah family who have seen tall, hairy Bigfoot creatures walk along the canal behind their house have asked not to be identified for fear of public ridicule. The mother first saw a Bigfoot when she was 15-years-old in 1968 in almost the same place that her 16-year-old son saw another large, hairy creature on January 2, 2003. It was 11:30 p.m. MST and "Billy," as I'll call him, was talking with his cousin on his grandma's back porch two houses over from his parents' house. Next PostNext Can the United States Cope with Bioterrorism Attacks?